It started at a very young age. I remember on my fifth birthday, my mother gave me $20 and I wanted to use it to buy a pair of shoes. That’s where it all started. I come from a Christian background and went to church every Sunday as a kid, and that was the day everyone dressed up and wore their Sunday best. My grandfather was the pastor and my grandmother was the first lady of the church. She would wear her hats, her shoes, mixing colors and patterns, and she also sewed herself. I loved seeing the beauty that she brought to her own fashion. And then as I got older, in my early teens, I knew I was into art, but more specifically fashion. I had the ability to go a vocational school my junior and senior year of high school and during that time I dove into making patterns, cutting, and sewing clothing. From there I went to college and studied fashion there. Where did you get your start in the fashion industry? First, I attended Norfolk State University, which is an HBCU back in Virginia. I attended that school for a year and a half and then realized that if I really wanted to learn about the fashion industry, I needed to be in a place where it’s really happening. New York was always my goal and on my 21st birthday, I went to the Art Institute of New York City’s open house. I went to the school there for some time until I really wasn’t able to afford it. It was a sad thing because my grades were amazing, but through that experience, I didn't give up. I started to intern for a few brands in New York City and also did freelance pattern making and sewing. I knew that I had my own voice. I knew from working through these other brands, there was something else that I wanted to do personally. It was just letting go of that fear of putting myself out there and deciding, this is what I want to do. That was the major inspiration — just knowing that I had a story to tell through fashion that was my own. Describe the woman your line is designed for. I don’t like to say every woman, but every woman. I use a lot of African print — Ankara fabric or Holland wax cotton as it’s also called. That’s something that’s very traditional in African culture, and I knew that I could use that fabric and make it something more universal. Being an African-American male, being an American, having African roots, I wanted to marry all of that together, but I had no idea that it would transcend to different religions, to different races, to different demographics. The woman that I really focus on is the woman who is confident. The woman who knows her beauty. The woman who understands her body. It’s a universal woman — a woman who just loves to feel confident and beautiful in her clothing and within herself. You offer clothes in sizes extra-small to 3X. Talk a little bit about that and what it says about the standards of beauty in our society. That's one thing that the fashion world has always shunned. Beauty comes in all different shapes and sizes and that’s the one thing that I wanted to focus on. I’m from Virginia Beach where the average size is a US 14. Before I moved from home to New York, a lot of my customers told me, as long as you make clothes in our size, we’ll support you. So I think that’s something that has kind of put me out there. There are a lot of plus-sized bloggers that spawned during the time when I started my brand and I love that they caught on to the fact that there are designers out there making clothes for them. We’re thinking about ways of inclusion instead of exclusion. Tell us a little bit about your partnership with Etsy. How did it begin? Etsy was the first place I thought about to sell my designs because it was easy and it was digital. That partnership started organically. They brought me into their studio a few times to talk to me about different things that they wanted to add to their website, and they’ve done a great job at including me in a lot of their content where they’re talking about how to start a business and how to run a business, and putting me on their mailing list of fashion designers to look for. What are some of the things that have helped propel your brand? Social media has been an amazing tool, a free tool. I use Instagram the most because it’s very visual and has a very instant impact where people can quickly see what you do, understand it, process it, and hopefully buy it. I think also, just being a designer of color and being a designer who really understands what it means to give back and include people. That’s been something that has kind of propelled me forward, too. I really didn’t have any idea that I would ever dress Beyonce. I never had an idea that I would dress Jill Scott. And I never had an idea that I could, hopefully, dress Michelle Obama. Just doing what you’re supposed to do, being obedient to your passion, it can get you really far. I have one really good friend back home in Virginia who has been a mentor for me since before I left Virginia. He’s a hairstylist but also has his own salon and he ran a restaurant for some time. We have different sides of what we do, but we’re in the same business, the business of service. He’s been very helpful — I pretty much call him every week to bounce business advice off of him, and vice versa. I also have a mentor in New York. He gave me my first internship — a paid internship, unheard of in New York — and the first piece of advice he gave me was, “The first thing I want you to know is in this business, you have to be nice to everyone.” It seemed obvious, but it was the best advice I think I’ve ever received. Be kind to everyone. You never know who’s who, and everyone knows everyone. Instagram user who inspires you? 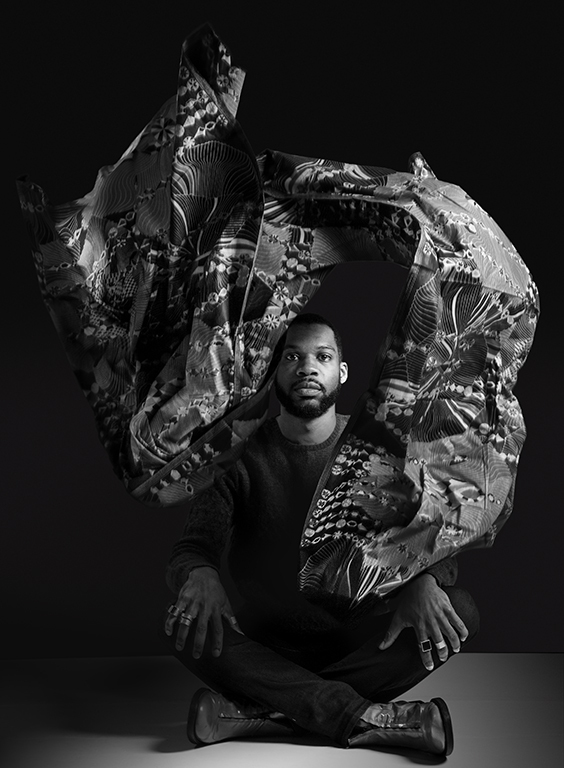 Reuben Reuel, creative director and designer of Demestik by Reuben Reuel, based in NYC found his love for fashion and style while growing up in his hometown of Virginia Beach, Virginia. His grandmother, a skilled seamstress with impeccable taste and flamboyant style, served as his primary influence and inspiration. She was the reason he decided to enroll at the Virginia Beach Tech Center where he began to hone his skills in fashion design. Upon completion he attended Norfolk State University and later moved to NYC in 2007 to attend the Art Institute of New York City. In 2012, Reuben Reuel decided to venture out on his own and create garments with a focused aesthetic. Taking a less conventional approach, he partnered with Etsy.com to sell his products. This allowed him to formulate a case study of the type of women that are interested in his garments and the ability to sell direct to consumer worldwide. In the past four years the business has grown 5X in sales since its conception with an increased worldwide following. The momentum of his vision and the growth of the brand are illustrated in his uncompromising product, quality and commitment to hard work.